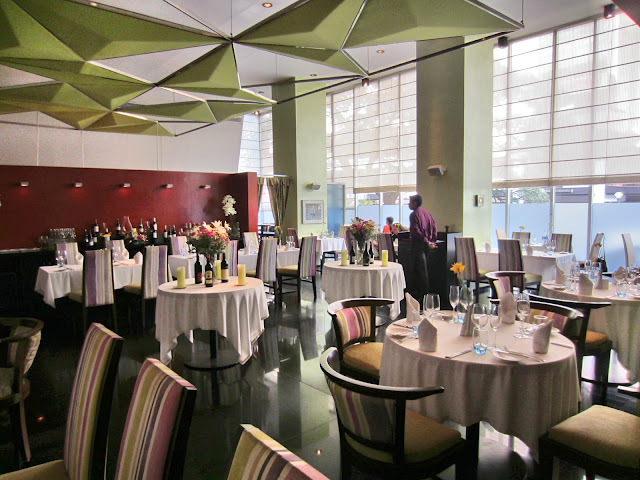 On a recent visit to Bangalore I had the privilege to try Chef Abhijit Saha' fabulous restaurant Caperberry. With the rise of contemporary & molecular cuisine... wait let me rephrase that.. despite the bastardisation of contemporary & molecular cuisine in the country, Chef Saha lets you believe again, in that world of foam, jellies and smoke. But it isn't just 'all that jazz', it is also about food that focuses on minimal ingredients, to allow the cleanest flavours to surface. 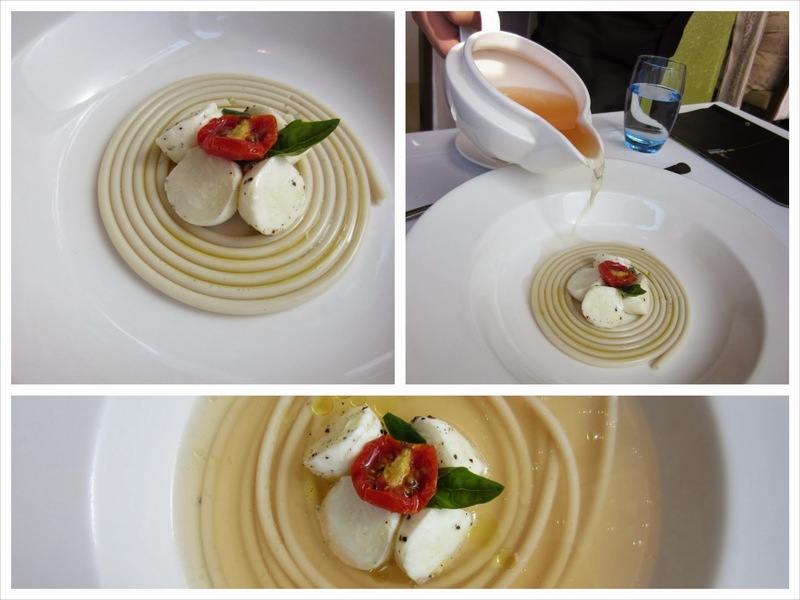 It is about presenting familiar ingredients, in the most unexpected ways - from passion fruit caviar to liquid mozzarella. 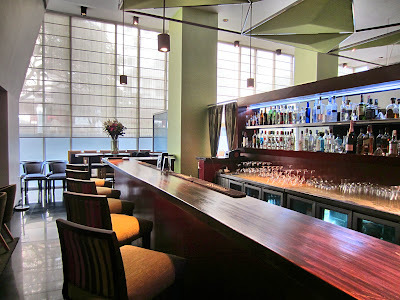 Chef Abhijit Saha believes in invoking all the senses with his food, and that is precisely what it did for me. I noticed the food lean towards latin & Spanish flavours, but when mentioned, Chef Abhijit was quick to interject that though inspired, the cuisine is best described as his "signature style". I have to admit the slightly dated decor did throw me off, I feared it to be a reflection of the food. But, thankfully, what the tasteless interiors lacked, the food more than made up for. The menus too looked like something out of Cafe Coffee Day. Not to nitpick, but the branding and interiors could do with an overhaul through the refinery. So they, at least half way reflect, the finesse of the cuisine. Anywho, lets get to the food. I decided to go for the Non-Vegetarian Tasting Menu - 6 courses. 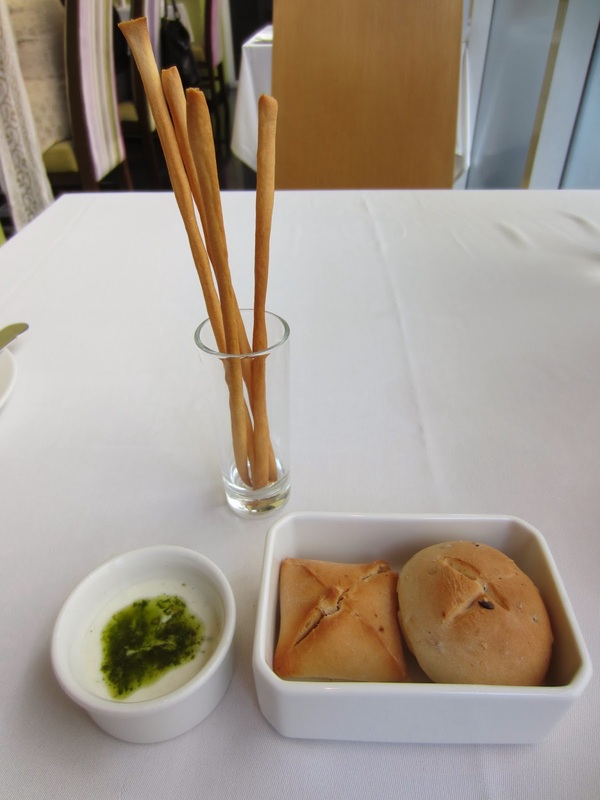 But I also tried a couple of things from the a la carte menu that I had my eyes on. Started with Bread sticks, two types of breads ( one was stuffed with onions & olives), served with a mayo Pesto dip. Both the breads were fresh and soft on the inside. The onion olive bread was more onion than olive but tasty nonetheless. The pesto was lovely but the mayo was a bit too retro in the midst of the nouvelle cuisine to follow. Spherification - One of Caperberry's highlights it seems, not part of my tasting menu. 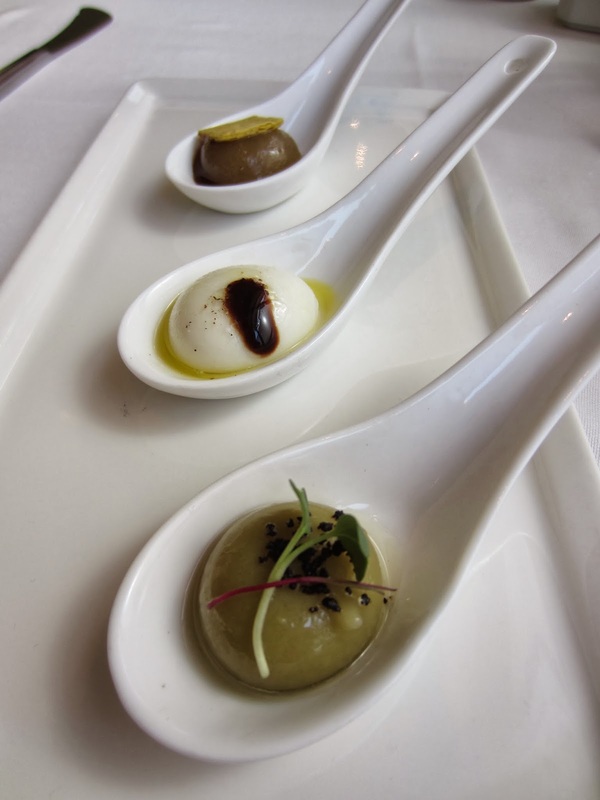 I am not going to go in to how spherification is conducted. There is always google, which will give you everything from what it is, pros, cons, and youtube videos! But in a nut shell, it is the process of 'parceling up' a liquid in an entirely edible form, by creating a thin gel membrane around it. This process was first discovered by a food scientist for Unilever and much later popularized by the Adrià brothers. What I love about spherificaion is that caviar like pop, as it hits your tongue. There is something sadistically satisfying about how willingly that skin rips, gushing liquid flavour in to your mouth. The 3 flavours given here were, Mozzarella, Gol Gappa, Olive. This is one of those things I would order more for the hype or novelty just once and that is it. It would however, make for a more impressive amuse-bouche. Tuna Tartare - I love dishes like this - that taste fresh, with bursts of flavour, and a sense of uncluttered purity. Here we have Grade A Indian Ocean Tuna, flavoured with soy, sesame, japanese ginger. Topped with passion fruit caviar & nori, a side of wasabi aioli & Danish Caviar. It also had a strong hit of lime, transforming it in to a sort of Asian inspired ceviche. Delicious. 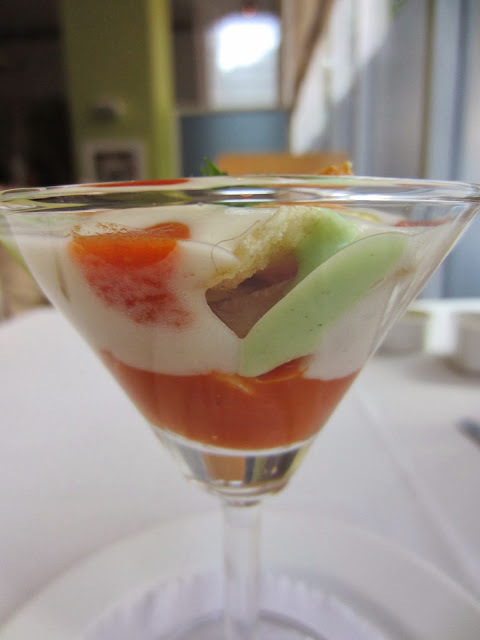 Patata Bravas - Chef Saha's play on a tapas classic. Instead of cubes of potato they made thin round potato chips, the white stuff is potato espuma (simply put a molecular foam), layered with a spicy tomato sauce and bits of parsley aioli. My mouth is watering just thinking about this. Again, a burst of flavour, crunchy, creamy, tangy, cautiously spicy. My only complaint was the parsley aioli. Unless one was careful to preserve every blob of it with every bite, most it just got lost in the also creamy espuma. The parsley flavour though, was a really nice touch and may have been nicer as a chunkier more resilient gremolata. Either way I loved every bite. 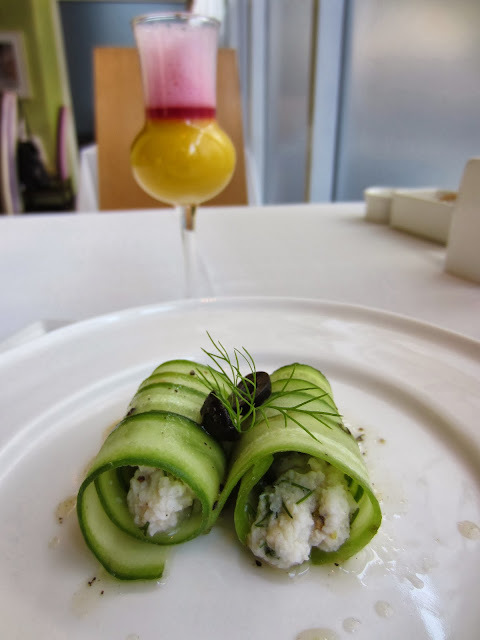 Cucumber Duo - Crabmeat Wrapped with Cucumber & Cucumber, Melon Gazpacho w/ Beetroot Foam. I really loved the gazpacho but didn't think much of the cucumber crab option. The crabmeat seemed oddly bland, void of its natural sweetness. Would skip this in the future. Chicken Spaghetti - This is one of those dishes that brings out the food geek in me. Innovative yet uncomplicated in flavour. Here the "spaghetti" is made out of chicken. Paired with a beautiful tomato broth, so pure in its flavour, it's like biting in to a fresh raw tomato. My only complaint, though ingenious to use sherry vinegar to replicate the tomato's natural acidity, it could have been done slightly sparingly. And to be really finicky, the bocconcini should have been room temperature, biting in to that cold center, in the midst of this soulful warm dish, did throw me off. It may not be a repeat for everyone but I do recommend it as a dish to try at least once. Olive Crusted Scallop - The saffron risotto could have been a tad creamier but it did pair beautifully with the scallop. I love scallops, this was cooked to perfection. The crunchy olive crust on the scallop was scrumptious. The white powder you see is a another molecular creation - dehydrated olive oil! A lovely dish overall. Silken Tofu, Morel stuffed w/ Ricotta, Pesto Oil, Morel & Porcini Cream - As long as you like tofu this is a fabulous dish. Such lush flavours, I felt the need to curtsy after the first bite. I especially loved how they seared the tofu, which gave the whole dish a lovely smokiness. 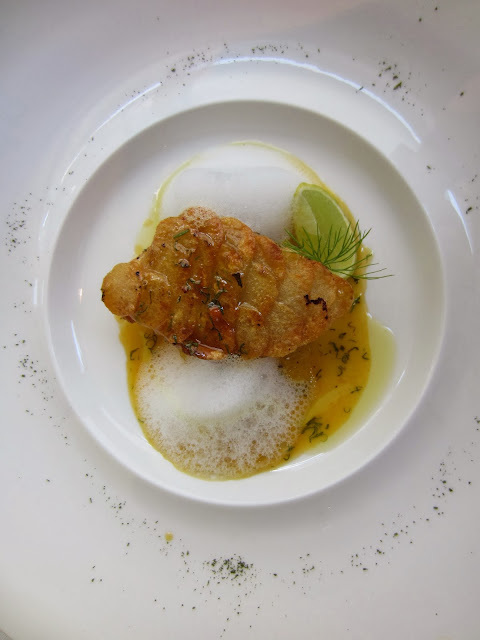 John Dory w/ Potato Scales, Lemon Foam, Citrus Dill Sauce - This was the gold medalist. Though the fish, much to my distress, was a tad overcooked, it does speak volumes that it still made it to number 1. I mean honestly, just look at it - beautiful inside out! A winning dish for me is one that I take back home. Memories of its aromas, colours, textures, linger with me long after the check has been cleared and the dish has been cleaned. In fact, the reason I finally got around to this review was because I woke up yearning this very dish! The fish had a wonderful crust at the bottom and top, more obviously because of the crunchy golden potatoes. The orange & dill sauce was just gorgeous, summery, light yet not shy of flavour. I did skip squeezing the lemon wedge, it was perfect as is. At first I thought the orange segments maybe a bit much with the orange sauce and the lemon foam, but they went so beautifully, I carefully calculated a piece with every bite. Need I say more? Ginger & Lemon Virgin Margarita - After my previous course, I very reluctantly sipped on this palette cleanser, I didn't want those flavours to evade me... ever! However, it was quite nice, as nice as any "virgin" drink could be. Splash in some tequila though, and it would be one swell margarita! 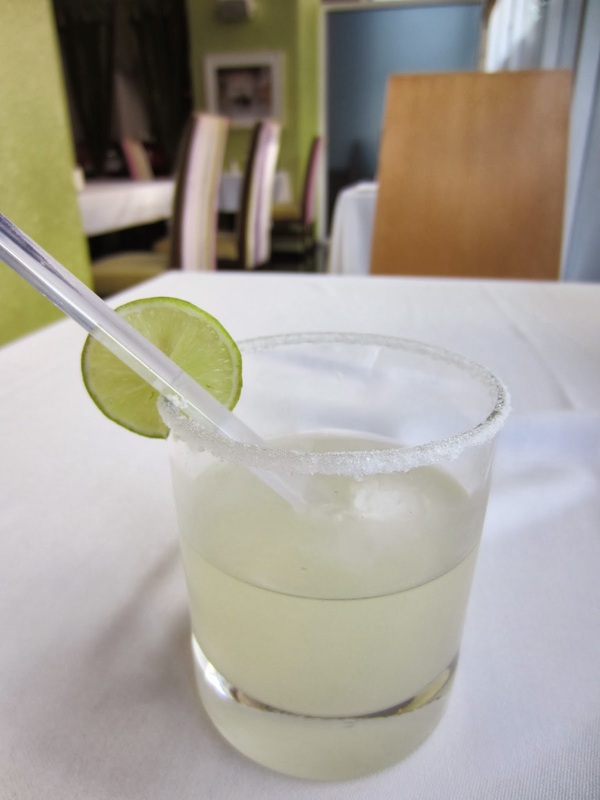 However, a mini margarita like glass, sans the cheap swivel stick, would have been more in accordance with the presentation standards of the rest of the meal. 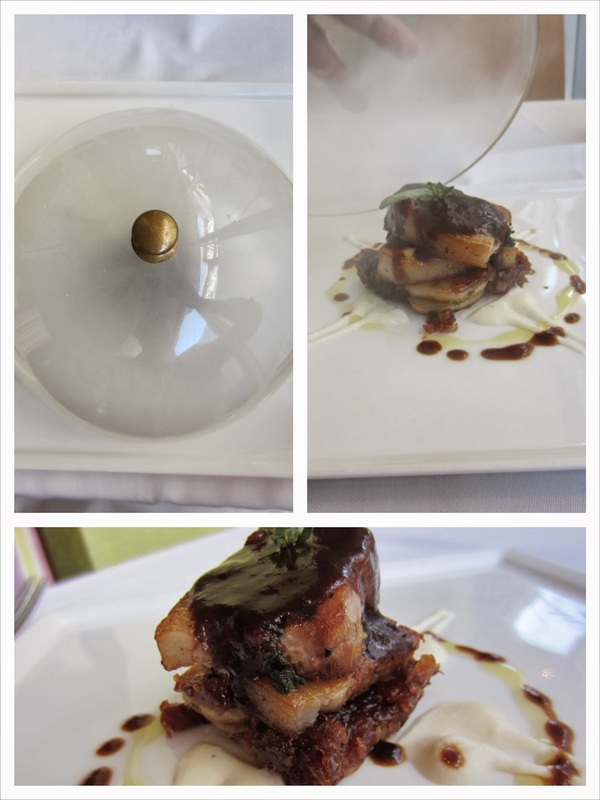 Smoked Pork Belly w/ Sautéed Potatoes, Turnip Puree, Sage flavoured Red Wine Sauce - Yet another dish to make a grand entrance. Came covered in a plastic cloche, that was used to contain maple wood smoke. The red wine sauce was a bit too salty for me and lacked the sage to merit its title. But the Onion & Apple Relish more than made up for it, which went splendidly with that yummy smokey pork belly. If only I snuck some in my purse back to Delhi! 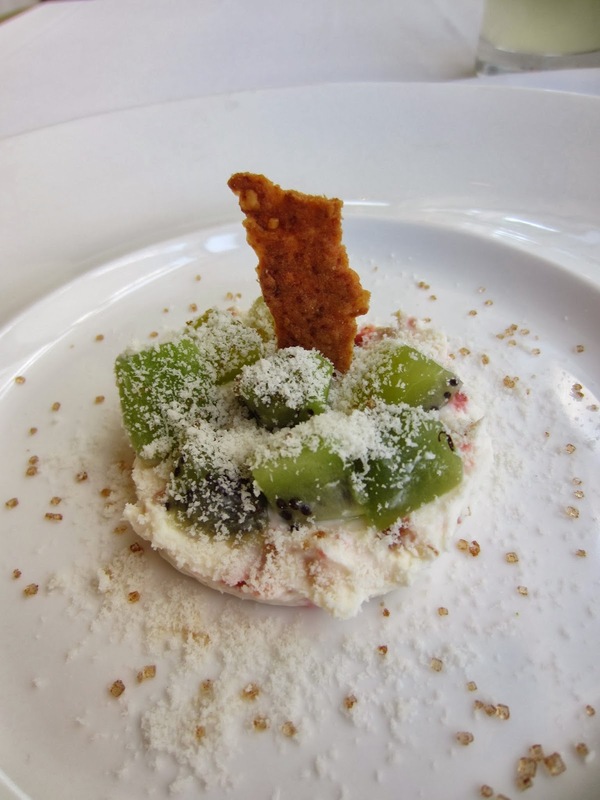 Goat Cheese Timbale, Kiwi, Candied Orange Peel, Parmesan Crackling - This was probably the only dish I found disappointing. Did not seem like a complete dessert to me, perhaps if there was more of that crunchy crackling, maybe if the whole thing sat in tart like shell of it? But just eating goat cheese and kiwi was not doing it for me. Also the kiwi needed to be sweeter, it was awfully tart to pair with the already tart goat cheese. I wish I tried one of the a la carte desserts instead, like the Coconut Dacqoise or the Belgian Choc & Caramel Mousse Cake w/ balsamic marinated figs and toasted pistachios! Frozen Chocolate Ganache w/ Beetroot Soil, Mint Soil, Cinnamon Powder - This dish makes you feel like a child again. At first it is met with jaded cynism as to why I have a pile of dust in a bowl, but with one bite the feeling evolves in to a childlike sense of wonder. The moment the frozen dust, combines with the moisture in your mouth, it transforms in to a thick, creamy ganache. The feeling in your mouth is really quite remarkable. And the crunchy bits of flavour from the various soils just completes it. Moving to UB City in January - will update.